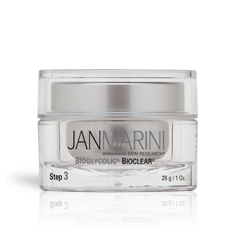 Jan Marini Skin Research Bioglycolic Cream is a highly moisturizing resurfacing agent that is suitable for all skin types. Bioglycolic Cream has a unique barrier emollient that helps to retain moisture in the stratum corneum. In addition, the benefits of glycolic acid have been greatly enhanced by incorporating a unique phytoamine bio-complex along with hyaluronic acid. These constituents mimic the water attracting characteristics of substances in the intercellular matrix of the skin. Our advanced formula will achieve results previously beyond the scope of glycolic acid.